The drum sets used by today's musicians are the product of a long evolutionary process that took them from the simplest percussion instruments to extremely complex set-ups. The birth of the drum set, or of different types of sets used for certain styles of music, can be dated to several different time periods. Drums were an important part of early human history. Archaeologists have discovered ancient drums that date from as far back as 6000 B.C. Although these drums may have been played in combination with other percussion instruments, they cannot be properly called drum sets. The drum set as we know it today could only come about once a wide variety of drums with specific musical purposes had been invented. Drums were developed simultaneously by cultures around the world, including those in Africa, Asia, and the Americas. Eventually drums were developed that could be built or tuned to produce a specific sound. These drums were used in religious rituals, for playing music, and even as a means of communication. Meanwhile, other percussion instruments were developed to compliment drum playing. For example, Chinese musicians built the first tom-toms while the ancient Egyptians developed cymbals that were very similar to the modern cymbal. The first collections of drums to bear a resemblance to the modern drum set appeared in the 1890s. The purpose was to reduce the amount of space on a stage taken up by the various percussion instruments. At the same time, assigning a percussionist to multiple instruments (known as double drumming) became common practice. Foot pedals were added to bass drums in the first decade of the twentieth century, allowing the percussionist to use their hands to play one, or even two other drums simultaneously. Early drum sets featured the bass drum at its center and additional drums or other percussion instruments attached to its top and sides where they were within reach of a seated or standing musician. In the 1920s and '30s, the developing form of jazz music made frequent use of the drum set and its many playing possibilities. Marching bands in New Orleans regularly featured players who carried a bass drum with other instruments attached to it. Other jazz musicians advanced the drum set by removing the other drums from the bass drum and placing them on their own stands. By the end of the '30s, jazz musicians had standardized the drum set to include the pedal-operated bass drum, a tom-tom, a floor tom, and a snare drum, as well as one or more cymbals (often a hi-hat, a crash cymbal, and a ride cymbal). Later the consolette was invented, which provided a connection between the bass drum and the tom-tom, allowing them to be mounted on top of the bass drum in the familiar upright position. The drum set remained the providence of the jazz musician until rock 'n roll appeared in the 1950s. Early rock drummers, most notably Ringo Starr of The Beatles, became major public figures and were associated with the brand of drums they used as well as their preferred drum set configuration. The standard set-up was discarded in the 1960s and '70s as rock musicians added more specialty drums to their sets. Multiple pairs of tom-toms were common, as well as an assortment of cymbals. Double bass drum sets included two bass drums. Electronic drums appeared in pop music in the 1980s and were often used alongside traditional drum sets both on-stage and in the recording studio. 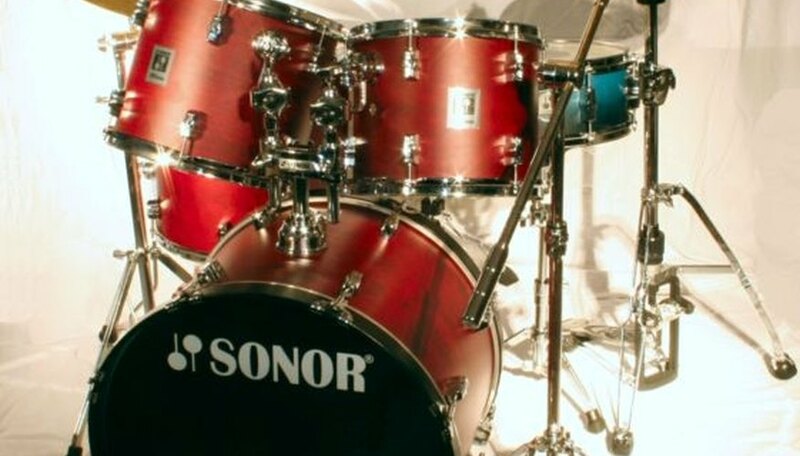 Shifting trends and musical tastes saw many popular musicians simplify their drum sets in the 1990s, moving back toward the traditional bass, tom-tom, floor tom, and snare scenario. Many rock drummers became celebrity musicians and sometimes were the most well-known member of their band. These famous drummers helped popularize certain types of drum sets as other musicians, professional and amateur alike, mimicked their set-ups in hopes of achieving the same sound in their own music. An example of this sort of drummer is Led Zeppelin's John Bonham, who played a drum set that featured mostly traditional drums that he played with great speed and dexterity. Carl Palmer, of Emerson, Lake, & Palmer, used a kit with an assortment of cymbals and images of his live performance often show him surrounded by large, gleaming cymbals. Phil Collins, a successful solo artist as well as a member of Genesis, was one of very few drummer/band leaders. Collins's live performances often featured multiple drum sets on stage through which he would alternate depending on the style of music being played.